The Tour de France is first geography lesson, second a bicycle race. Before a pedal has been turned we check maps and look at elevation profiles to parse the route. Mountains, valleys, plains and coastlines matter. But just as a teacher gives the same lesson to a different class every year, the Tour tends to repeat the same climbs over the years as the riders come and go. Only 2014 has a new climb, the Col de Palaquit. Almost one thousand metres in vertical gain and with double-digit gradients it looks hard on paper. What is it like to ride? Just to the north-west of Grenoble, the D105a climbs out of the village of Saint-Egrève passing through the village of Quaix-en-Chartreuse and soon after, via a left turn, follows the road uphill for Sarcenas. Soon after Sarcenas the road ends and joins the larger D512 road, better known as the Col de Porte. This junction of the two roads marks the Col de Palaquit. Turn left to continue up to the Col de Porte, turn right to follow the 2014 Tour route downhill to Grenoble and onto the summit finish in Chamrousse. The climb leaves the valley at 250m above sea level and finishes at 1154m and with a short descent mid-climb it means there’s close to 1000m of vertical gain during the 15km ascent. The average gradient of 6% includes this descent and the profile below indicates the steeper parts. There are some climbs that don’t have an obvious start but the road out of Saint-Egrève points straight towards the Chartreuse massif, winding up a valley cut between two vast cliff-faces that rise high above the town’s rooftops. There’s a steep ramp to leave town and then the road levels out with the sound of waterfalls in the canyon below. A bridge over the small river marks the start of the effort, a series of hard hairpins separated by 12% ramps make the going hard. The village of Quaix marks a rest point unremarkable but if it’s hot you can fill your bottles in the tiny square. There’s a quick descent, awkward with a turn that tighten up more than you think. It’s here that the most boring section of the climb appears, a soft gradient amid open fields. Be sure to take the left turn soon, follow the signs for Sarcenas. All along the climb alternates with sections of narrow road cut into the hillside and open parts through pastures. It’s a scenic climb, there’s just local traffic for the houses higher up. You climb with views of corn fields in the valley below and the almost volcanic Néron mountain to the right. It has a sinister feel, rightly so landslides have buried entire villages in the area. In time the road pitches up and the tarmac becomes a black ribbon draped around the mountain. The Tour might have hot weather but in spring and autumn the woodland and north facing slope make it cold and frost damage is evident. The sign marking the village of Sarcenas marks the end of the hard work and as you pass through the village later note the views of the Chamechaude from here. It’s France’s fourth highest mountain when measured in topographic prominence. The top of the pass is a literal anticlimax. All that effort and there is only a sign to indicate the col but as arrive at a T-junction. There’s no view, just a busy road, the “Route de Chatreuse”. Turn left for more mountains via the Col de Porte or right for the fast descent to Grenoble but you will have to share the road with touring motorcyclists and holidaymakers out for a drive. Overall it’s an irregular climb à l‘italienne with some sustained steep sections that require low gears. It’s the penultimate climb for Stage 13 and should be a first category climb (How Are Climbs Categorised?). The Palaquit is not fearsome but there’s no escaping the vertical gain of almost 1,000m and 12% gradient in places. The preceding kilometres are flat and the race will speed along the Isère valley as teams aim to place their leaders at the front before a sharp left turn and the climb begins. The best thing for the race is the uneven nature of the gradient which make it harder for a team to set a tempo. It’s selective in that we’ll see plenty dropped here but the main riders should hang together surrounded by a helper or three. The Palaquit is followed by a fast descent, the traverse of Grenoble and then the final climb to Chamrousse. The Palaquit’s inclusion on the route is vital to spicing up the finish. This road hasn’t been climbed before in the Tour de France but the col has been passed 18 times by the Tour de France. How can you cross a pass but not take the road? To explain, the col sits at a T-junction and the Tour has climbed and descended the main road runing north-south 18 times in total on its way to or off the Col de Porte. But it’s never taken this side road. The Dauphiné however did climb in 2004 under the inaccurate “Col de Sarcenas” label. It was the final stage and Stuart O’Grady ditched Sandy Casar on the climb to solo to the win. The race was “won” by Iban Mayo ahead of Phonak pair Oscar Sevilla and Tyler Hamilton. A pharmaceutical festival. The Col de Palaquit from St. Egrève isn’t going to top your bucket list of must-see European roads. It is scenic and worth climbing if you happen to be in the area. The Tour will help to sprinkle some stardust on the road so that cyclists wanting to climb up from Grenoble to the Chartreuse mountain range take this way rather than the busy main road that tackles the Col de Vence and runs over the mountains to Chambéry, a classic Alpine route. You can also take a similar route up via the Col de Clémencières right out of Grenoble, a steeper alternative. You can ride in every direction in Grenoble. North to the Chartreuse, east to Chamrousse and over to Alpe d’Huez via the Col de Luitel if you like. A variety of roads lie to the south – just avoid the highway that is the Col de Laffrey – and then to the west is the Vercors park that’s packed with scenic climbs. All directions offer rewarding rides. Grenoble is well served with road and rail links including some direct high speed trains from Paris. There is also a small airport but international air traffic is better via Lyon. Grenoble has a fine location but the city is a mixed place reviews. It’s a university town surrounded by the mountains and some high tech industries. Climb the Palaquit and you’ll see the donut-shaped Synchrotron research base in the valley below. But the town has its less attractive areas too so do your homework before picking a place to stay. A new climb for the Tour de France and a significant one. It might be a side-road in transport terms but it will reduce the peloton substantially before the first Alpine summit finish of the 2014 Tour. It matters in this tactical sense but for the rest of the year it’s just a quiet little side road, a rewarding climb in a scenic part of the Alps, a quick escape route from the noise and industry of Grenoble and Isère valley. Ride it if you’re in the area. Some days ago, watching the maps of the 2014 Tour de France route, I was wondering if the Grenoble Bastille could be climbed. It seemed a nice stage finish, a punchy one after descending one of the many bigger ‘coles’ that surround the city. So there is the answer. But I think that those gradients that you mention are too much, although if Grenoble was somewhere in La Mancha, Vuelta organizers would put its “Castillo” as a finish line every year. Are the Vercors ever included in the Tour? I spent a couple of days riding there just because I was in Grenoble after a week riding in the Alps. Beautiful with interesting history as a center of the Resistance during WWII. From time to time, yes. Several times in the 1980s, more recently 2004 at Villard de Lans. The photo of the Chartreuse massif is great, and this seems like a very nice road to ride up. On a tangent, what is the link (if there is one) between the Chartreuse and the yellow Rapha call chartreuse? I think we can get there in a few steps. Chartreuse is the name of the mountains and there is a monastery there. The monks have made herbal liqueur there for years which is green but there is a sweeter version that is yellow. So “Chartreuse yellow” is a drink. But the mountain range has a road that runs across it with three main mountain passes and this “trilogy” has been part of Tour de France legend although not used for some time. 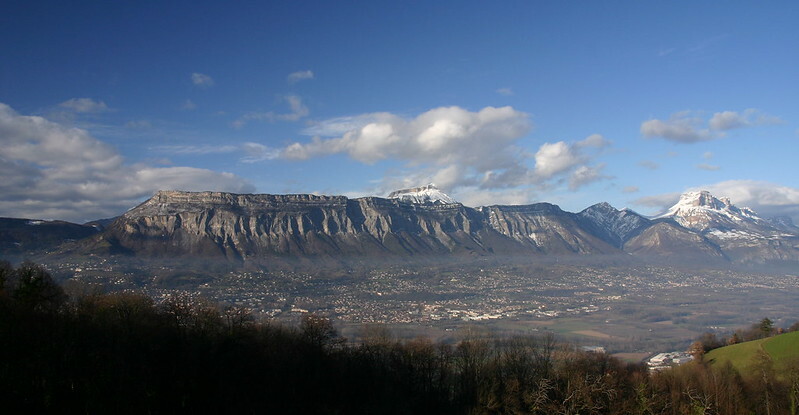 Grenoble and the surroundings are a lovely part of the world and the Vercors is an overlooked gem. The Bastille would make a cruel leg-breaking finish. It was raced in the 80s and 90s with a famous recovery from Bernard Hinault who had crashed on the way there during the Daupine Libere. And if I remember a velocast Week in cycling History correctly it is where Indurain finsihed his career, maybe riding a triple chainset to deal with the steepness of the gradient climbing to the Bastille. Topographical prominence….now there’s a link that has cost me an hour of my life…fascinating though!